Japan's All Nippon Airways (ANA) has achieved the impressive accomplishment of posting a record profit not only in the current economic environment but in the year immediately after Japan’s Mar-2011 devastating earthquake and tsunami. ANA's JPY97 billion (USD1.2 billion) operating profit came on the back of international growth and early introduction of cost-cutting measures. While ANA may enjoy this momentum for another year or two, its medium- and long-term strategy is far from certain and could challenge the ability to repeat ANA's recent gains. The Japanese market is about to undergo a significant structural shift with the introduction of LCCs that will reshape domestic and short-haul regional flights. ANA is fully aware of new LCCs – its subsidiary Peach was the first to market and ANA will shortly co-launch AirAsia Japan – its management plan has seemingly not taken the carriers into full consideration. Rival Japan Airlines is planning to decrease its exposure to the domestic market, already lower than at ANA, while ANA is planning to grow its LCC-exposed domestic network. History suggests ANA's domestic strategy is in substantial need of revision. ANA's 43% increase in operating profit came on the back of strong cost control and a 4% increase in revenue in the 12 months to 31-Mar-2102. 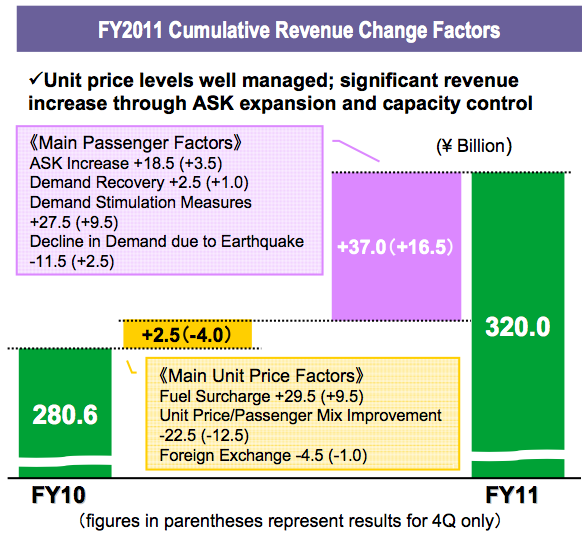 Air transportation accounted for approximately 90% of the company's revenue and profit, a remarkable change from the carrier’s outlook in 1H2011 when it posted a JPY50.1 billion (USD626 million) operating profit while expecting a very weak second half that would see a full year operating profit of only JPY70 billion (USD875 million). Instead ANA effectively repeated its first half performance even despite global economic headwinds. The carrier's fiscal year commenced on 01-Apr-2011, three weeks after the 13-Mar-2011 earthquake and tsunami. Initial capacity dropped sharply, but domestic business demand rebounded by Jun-2011 while domestic leisure demand was more or less back by the end of the fiscal year. International demand took longer to recover; business demand had nearly rebounded by Jun-2011, at the same time Japanese-originating international leisure traffic recovered. Inbound tourism to Japan however still remains weak, with global economic uncertainty adding to woes. ANA made capacity adjustments, applied fare promotions and worked with tourism authorities to boost Japan's image overseas. ANA reports "steady" consumer spending domestically but "sluggish" growth internationally. 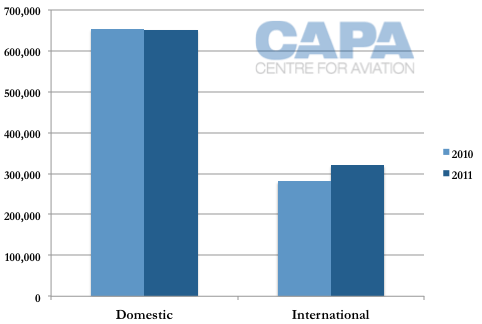 Available seat kilometres in the domestic network shrank 0.1%, but not enough to match the 3.9% decrease in revenue passenger kilometres, leading to average load factors for the year falling 2.4ppt to 60.9%. International load factors also dipped, by 1.7ppt to 73.7%, but this fall occurred as ASKs increased aggressively by 15.6% with an accompanying 13.0% increase in RPKs – all in challenging times. Meanwhile domestic passengers declined 3.8% year-on-year but thanks to ANA's continued market power, revenue only decreased by 0.2%. There was greater equilibrium in the international market, where passenger numbers grew 13.8% and revenue grew 14%. Revenues benefited from ANA's trans-Pacific anti-trust joint-venture with United Airlines, which was introduced at the start of the fiscal year. Very approximate indications show ANA increased its sales on United flights by 150% while United increased its sales on ANA flights by 300%. 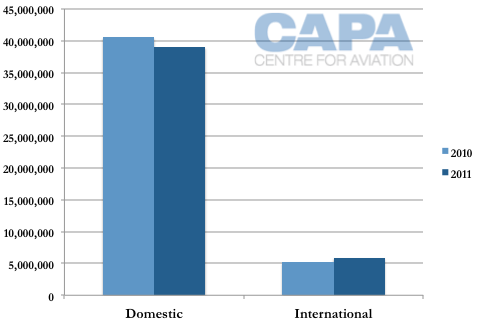 Revenues should be boosted again in 2012 with the forthcoming commencement of the ANA-Lufthansa joint-venture. The increase in international flying and introduction of the 787 also benefited cargo, which saw a 2.2% increase in revenue to JPY88 billion (USD1.09 billion). ANA is increasingly using its cargo facilities, including a new one at Okinawa, to act as hub between multiple countries, rather than cargo originating in or destined for Japan, reflecting the country’s decreasing manufacturing. ANA said the 787 allowed it to be more competitive but did not disclose further details. This advantage, in whatever form, will be narrowed as operators, including JAL, continue to renew their fleets, often with the 787 too. During the year ANA reduced its 747-400 fleet by three frames, A320 fleet by three frames, 737-500 by one and Dash 8-300 by two; simultaneously it added six 787-8s and had a net addition of two 767-300s, two 737-800s and three Dash 8-400s for a total change of four additional aircraft. On the cost front, ANA introduced JPY30 billion (USD374 million) of emergency cost containment measures following the earthquake, while also introducing some elements of a JPY100 billion (USD1.34 billion) cost cutting programme previously not due for introduction until FY2012. ANA, pointing to the usual suspects of high fuel prices and economic uncertainty concentrated in Europe, but also appreciation of the yen, stated "we cannot expect high growth in the next fiscal year". This is of some concern given ANA's planned ASK growth in 2012 of 11.2% internationally and 3.2% domestically. Tokyo-Seattle services will commence in Jul-2012 with 777-300ERs, later switching to 787s, with California's San Jose also coming online in FY2012 as a new – also 787 – destination. If current economic conditions continue as expected ANA will inevitably experience further declines in load factors, already on the low-end by international standards (73.7% internationally, 60.9% domestically). ANA could also examine, depending on the cargo market, replacing 777-200/300 services with 787s, which carry fewer passengers and have a lower operating cost. Joint ventures could help ANA expand overseas revenue, which accounted for only 13% of all sales in FY2011. 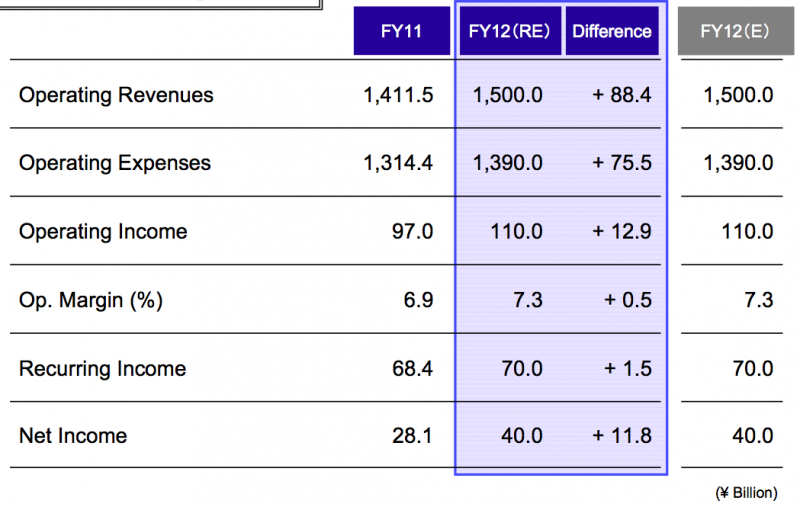 For FY2012 ANA Group, including AirAsia Japan, projects a 6.3% increase in operating revenue to JPY1500 billion (USD18.75 billion) as it grows domestic ASKs 4.1% (increasing revenue by JPY43.5 billion (USD544 million)) and international ASKs 11.9% (increasing revenue by JPY50 billion (USD625 million)). ANA projects a new record operating profit of JPY110 billion (USD1.4 billion) and a .5ppt improvement in margin to 7.3%. Long-term the company seeks a 10% margin as it increases the return on its international network. More concerning however is ANA's medium- and long-term strategy which, based on stated information so far, will be in need of revision. The entrance of new LCCs in Japan will require fundamental changes by incumbent operators. JAL has already realised and acted on this, planning to decrease its domestic exposure and shift existing domestic capacity to more regional markets while increasing frequency. The LCCs are unlikely in the medium-term to enter Japan's regional cities or concentrate on corporate-appealing schedules that offer multiple frequencies. 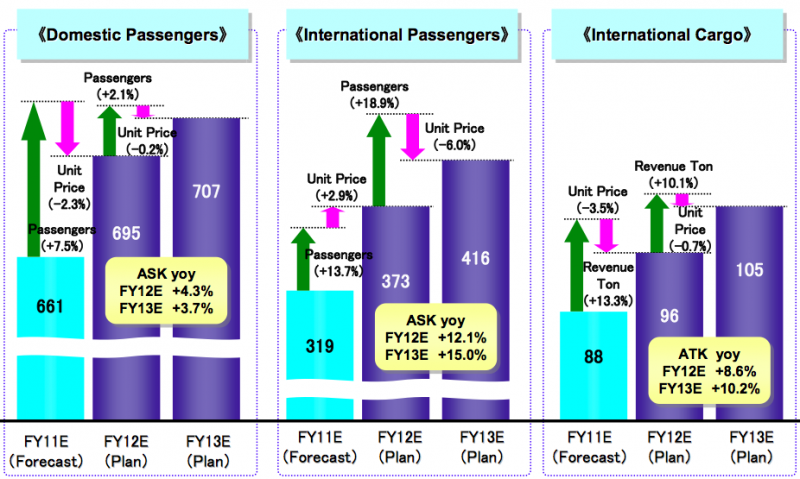 By FY2016 JAL plans to grow its international ASKs by 25% but shrink domestic ASKs by 3% compared to FY2011. 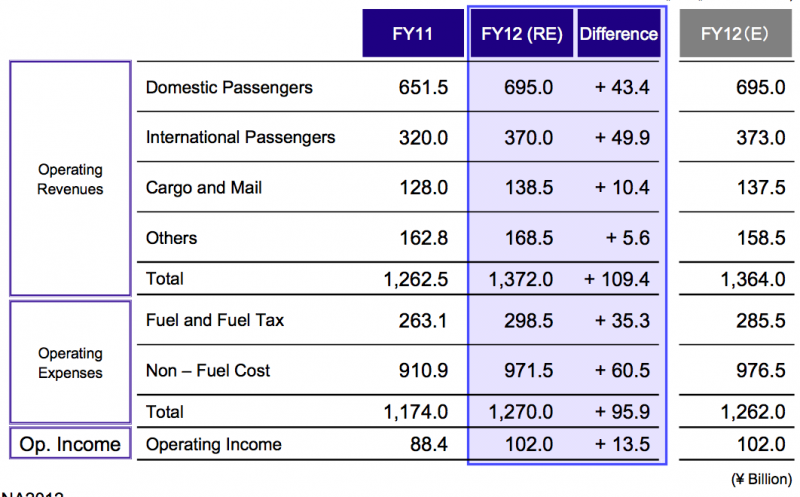 ANA mainline (excluding AirAsia Japan) plans to increase international ASKs by 11.2% year-on-year in FY2012 and a further 9.3% year-on-year in FY2013. However, it is not showing domestic capacity discipline. Domestic ASKS will see year-on-year growth of 3.2% in FY2012 and 2.5% in FY2013. ANA has not disclosed exact projections beyond FY2013. 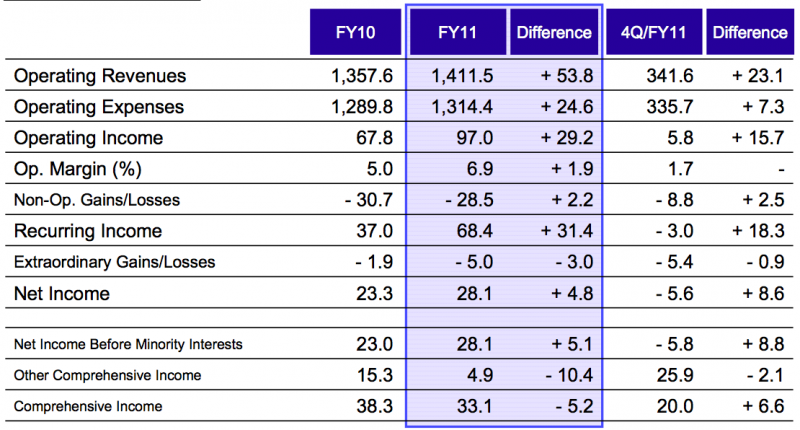 In comparison, JAL will grow domestic ASKs 4% in FY2012 and plans no growth in FY2013 before starting to shrink ASKs. 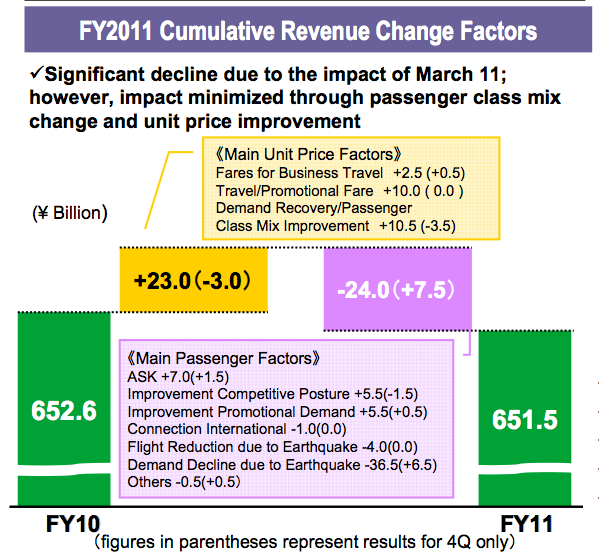 After the next expansion of Haneda and Narita slots – around the FY2015 timeframe – ANA does envision dropping mainline capacity, but only to FY2012 levels. This causes some bells to ring; ANA currently accounts for 46% of all domestic ASKs in Japan and JAL Group for 33%. ANA has 41% more domestic ASKs than JAL. ANA's already large exposure to the domestic market will quickly face aggressive price competition from LCCs. These must inevitably be disruptive, to an extent hardly envisioned in ANA's outlook. In its outlook ANA makes passing mention of increasing Japan's role as a sixth-freedom hub, but this strategy, even if preliminary, requires further discussion. Chinese carriers are increasing their sixth-freedom operations, and with considerably lower cost bases than Japanese (as well as Korean) carriers, Chinese hubs would have significant cost advantages over Japanese ones. 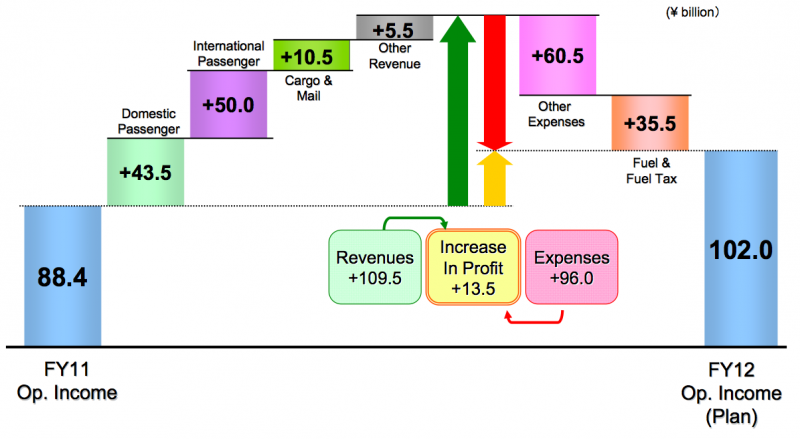 While transfer traffic could be used to justify maintaining a large domestic and even short-haul regional network, the experience in matured markets of North America and Europe with high LCC penetration rates is that transfer traffic alone is not enough to profitably sustain a full-service short-haul model. ANA is sitting on tremendous potential. It will have two LCCs in the yet-to-boom market of North Asia, a strong long-haul network and even stronger domestic network and, never to be overlooked in Asia, a sizeable (and apparently growing) cargo operation. But potential does not automatically afford opportunity. Capping LCC growth will only fuel competitors while undermining ANA’s long-term profitability. Allowing the LCCs free rein – or as close as possible in Japan – may require a seismic change but will be necessary. Accompanying that will need to be a decrease in ANA’s domestic mainline capacity to address not only cannibalisation but low load factors. ANA may be enjoying its current status as the main carrier in Japan, having eclipsed JAL, but there will be no pride in future under-performance, as yields decline sharply.